In Lighthouse Loyalty, a historical fiction book, young Susan Rose Arnold reads old newspapers and wonders about the recently ended American conflict, the Civil War. One afternoon she reads about Fort Fisher and Wilmington’s port, which played important roles in the maritime aspects of the war. Located at one of Cape Fear River’s two outlets into the Atlantic Ocean, Fort Fisher was twenty-one miles from the city of Wilmington, North Carolina. Originally, the locals called the location Federal Point or Confederate Point, but today’s it’s re-named Pleasure Island. In 1861, Confederates moved artillery to the fort location, and the following year began building fortifications and moving heavy artillery to the point. Mostly constructed of large earthworks, the building effort consisted of backbreaking work. Confederate soldiers, slaves, and civilians pressed into service labored to create the fort. 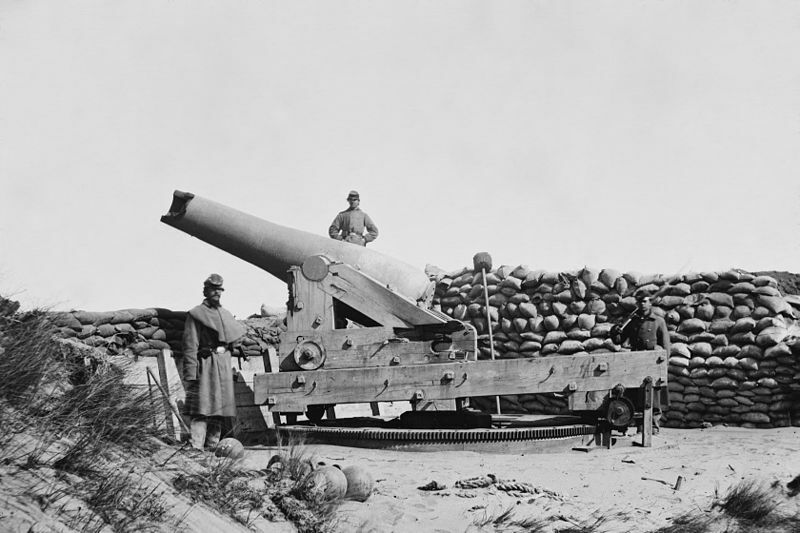 At the end of 1863, Fort Fisher was the largest fort in the Confederacy and an additional battery was added in 1864. Fort Fisher – the sea-facing fortifications. Fort Fisher had great strategic importance. It guarded one of the approaches to Wilmington, North Carolina, which became one of the few seaports open to the Confederacy as the war continued. With heavy artillery, the fort forced Union blockader vessels to share farther offshore, giving Southern blockade runners a better chance for successful escapes. Map of Fort Fisher’s location and details of the Union’s second attack. Although located miles upriver from Fort Fisher, the city of Wilmington relied on the fort for safety. Wilmington was one of the largest blockade runner hubs during the conflict, a vital link for importation and exports to the Confederacy. With the Union blockade, limiting supplies and communication with Europe, it was essential that this port remain open…as long as possible. And the Union knew it was essential to shut down Fort Fisher and the Wilmington operations as the war dragged on toward a conclusion. They brought in vital supplies, valuable information, and vain luxuries. Support the Southern economy by exchanging cotton for war materials. By 1864, Wilmington, North Carolina – thanks to Fort Fisher – was the last Confederate port open to commerce and blockade runner “trading.” With other ports successfully blockaded, the Union naval forces turned their attention to Wilmington. And Fort Fisher had to be captured. In December 1864, Union troops were detached to attack and capture Fort Fisher while the Confederates filtered more men into this important defensive position. On December 24, 1864, the Union navy began bombarding the fort from the sea and some of the fort’s artillery batteries were damaged. Ultimately, the infantry attack in December failed from poor leadership and a quick retreat. The Union’s second attempt began on January 13, 1865. This time Union soldiers effectively surrounded the fort and breached the fortifications on January 15th. 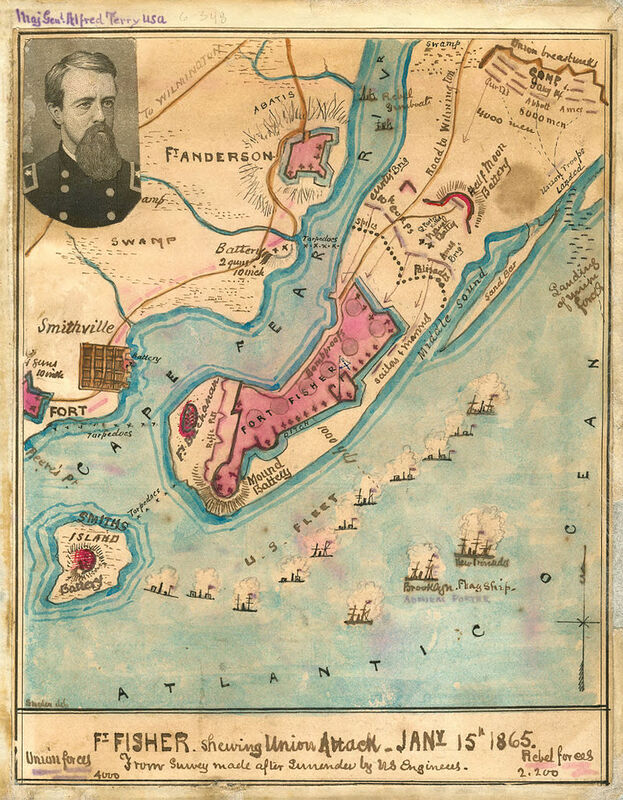 After a six hour hard fight, Fort Fisher was in Union control. The Union’s first attempt was lead by General Benjamin Butler, who was relieved of command after the failure. The second and successful attack was directed by General Alfred Terry. The Union’s North Atlantic Blockading Squadron also played a major role. On the Confederate side General W.H.C. Whiting commanded troops in the district and the fort’s garrison was commanded by Colonel William Lamb. On January 16, 1865, the fort’s powder magazine exploded, killing about 200 Union and Confederate troops. Both sides blamed each other for the accident, but it was eventually concluded that drunken Union soldiers had been messing around with torches in the powder room. One of Fort Fisher’s heavy guns with the muzzle blown off. 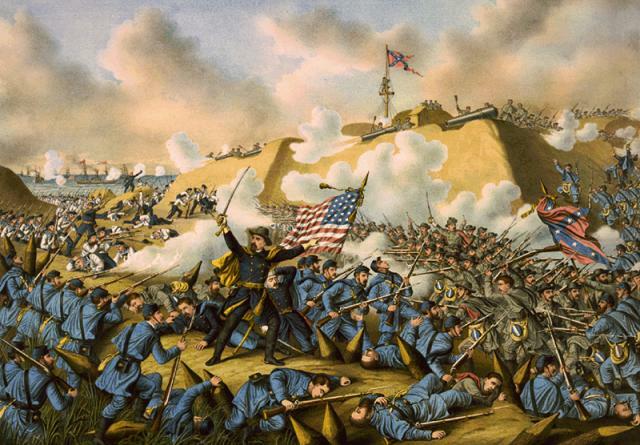 The Second Battle of Fort Fisher was hard fighting and resulted in the Union’s capture of the strategic point. Fifty-one Union soldiers, sailors and marines received the Medal of Honor for their combat actions at Fort Fisher. Today, Fort Fisher is preserved as a National Historic Site, available for historical visits. About ten percent of the fort is still intact and archaeological studies and historical research continue to learn more about the site. For visiting information, check North Carolina’s Historic Sites website. P.S. Have you visited Fort Fisher or Wilmington? They’re on my bucket list for this year!